Casino Bandstand offers the ideal package of musical entertainment for your Casino Nights event. 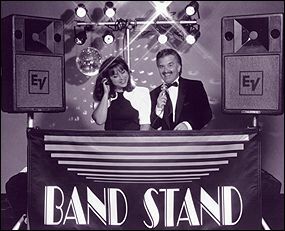 The skilled Casino Bandstand Emcee will provide you with the music to fit any setting or theme. For any audience, Casino Bandstand has the music that people want to hear. From 1940's Big Band & Swing to today's top 40 hits - From 1950's Rock'n'Roll to 1970's Disco - From Country to Classic & Alternative Rock... Casino Bandstand has is all, and knows how to use it to best advantage at your event. As your Casino Bandstand Emcee, Nels draws from his personal performance experience and musical background. Beginning in his youth as a drummer in the scout corps, he performed in rock bands throughout his school and college years. Graduating from UW Whitewater in Business and earning a Masters in Counseling and Guidance have given him a unique balance between the music and business worlds.. He offers your event his qualifications to entertain, an overall knowledge of the music business and the enjoyment of his work.